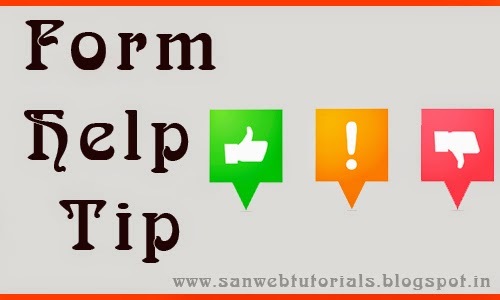 Form Help tip or Tool tip is used to explain about the particular text box or select or any type of field. It is very useful the customers to know what is corresponding field refers. This script is very useful to the developers to develop the form and tool tips. This is also called as a Form Help tip. In this Tutorial i am going to explain how the form help tip is working. This is very useful and customer easily understand the field. In this program i given one image in right hand side when you move the cursor to the image it will show the hint for the particular field and also when you click the text box it will give the same hint.